Have you ever tried to convince someone to listen to a song but were shot down on the basis of the band’s weird/awkward/offensive name? For months, I’ve championed the work of Portland’s Starfucker, a group of electroweirdos who produce the most marvelous dance music these ears have heard in some time. But that name, man. That damned name gets people every time. Granted, it’s not Starfucker’s fault that most folks crave familiarity, normalcy and, apparently, lupine names (Wolf Parade, Wolf Eyes, AIDS Wolf, et al). They fear change. I pity those Buttars-minded individuals who repeatedly rebuked my appeal. One listen and those naysayers might have found themselves tapping their toes to a song like “Holly,” the track off Starfucker’s self-titled debut recently used in a catchy IBM commercial. I asked Starfucker what their parents thought of the name. The lack of response leads me to believe that they might be the spawn of Satan. Listening to their album might otherwise lead you to believe that, minus the name, this band is celestial and worthy of a good ol’ fashioned Utah hoedown. A surprising number of groups are embracing the F-bomb, a trend that has neither helped nor handicapped Starfucker’s trajectory. Their name is more coincidental than sheer marketing genius. They—get this—attract audiences based entirely on a refreshing blend of addictive dance loops and breathtaking pop. That’s right, it’s all about the music. As with obscenity-laced monickers, looping has become 21st century musicians’ bread and butter. Looping is very similar to jazz music in that there are really only two kinds: great and terrible. Thankfully, when it comes to looping, Starfucker is king. When you wade through songs like Rawnald Gregory Erickson 2nd, you’ll realize the loops are minimalist with multiple layers playing off each other to create perfect adolescent dance grooves. Their sound catches a teenage feeling and is quite palatable to those that have had similar childhoods to Starfucker. Re-creating Karate Kid scenes, listening to Madonna and Cyndi Lauper on the Walkman but spinning the volume to zero when the cool jocks walked by, being in love with your teacher and accidentally calling her Mommy, being shy—uncomfortably shy. Starfucker has taking these childhood memories and turned them into some incredibly enjoyable dance hits to come out this century. Josh Hodges left his former band Sexton Blake who, at the time, were intent on “making it,” while he just wanted to create more innovative sounds with music as a means and an end. Starfucker was born. Many bands get stuck in the same situation; you try shooting for the stars and eventually run out of bullets. Hodges has created a band that’s brimming with success without setting out to do so. From being the most adored house party band in Portland, to showcasing at CMJ, Starfucker proof is in their live performances. 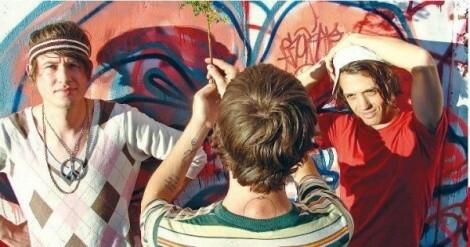 Their show at Kilby Court in October 2008 became an instant dance party, which is pretty much par for the course. “The people there were awesome, the crowd was awesome,” Hodges says. This might be why they’ve decided to stop by in Salt Lake City on their way home to Portland, Ore., playing a second show at the Urban Lounge on April 30. Starfucker’s previous trip to Utah was a little different than the ’09 spring tour: “Last time, we brought a camp stove and cooked pasta,” says Hodges. They also survived off “whatever the venue might give us.” Now with a bit more success and a larger van, skateboards, and the addition of Keil Mitchell on drums—whom they describe as being “a superhuman robot machine sent to us from the past future”—Starfucker is set to start a Converse fire whenever they play.